You all know how much I love making pizza. Everything from the dough, the sauce, and the fun part for me is the toppings. One of my latest creations was the Wisconsin bratwurst pizza, and as I normally think that while eating a slice that it might be my most favorite slice of pizza ever, another pizza creation of mine comes along and takes over. Damn you pizza, damn you! Pizza however is one of my favorite things to make, and eat for that matter. It allows me to perfect the dough, to tinker with temperature and time, and well, use my imagination when it comes to the toppings. 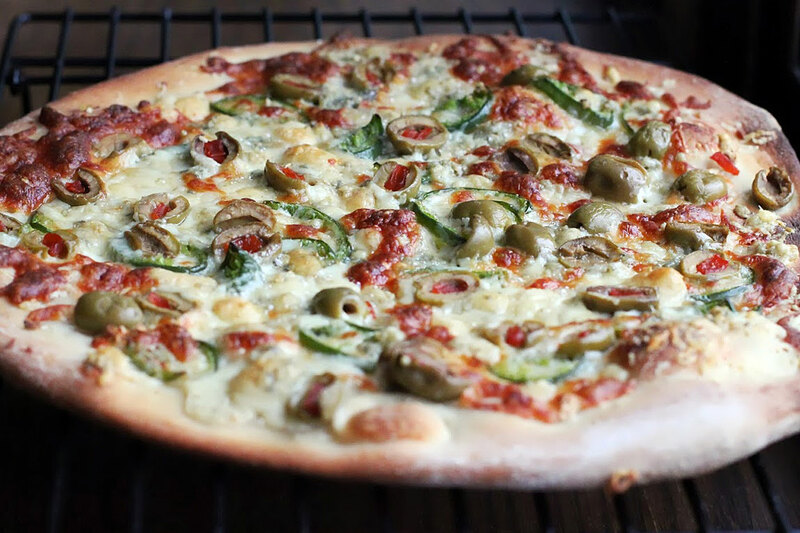 I thought of this pizza only because I had stuffed olives on my mind. Who knows, maybe I had a martini on my mind, and heck, I do not even drink martini’s. But the idea of having a blue cheese stuffed olive, along with a garlic stuffed olive came into the picture. That, and that alone was the reason why I came up with this amazing olive and blue cheese pizza. As you can tell, this pizza does not use any red sauce, nor does it use any olive oil on top of the pizza. This pizza stands out on its own and does not require any type of sauce, trust me. Start by preheating your oven to 475 degrees. Place a large circular baking sheet, or pizza pan into the oven to preheat while you make your pizza. Lightly flour your dough ball, then begin pressing it with your fingers. Flip to repeat. Use a rolling pin if you desire to get the dough working, then begin to toss it. Here is a video as to how to toss a pizza. It’s fun, and the kids love seeing it be thrown into the air. Once your dough is ready, and you have your desired thickness, remove the pizza pan out of the oven with your kitchen mits. The pan will be really hot, so be ready to place it onto a wood cutting board, or a potholder. Drizzle the olive oil onto the large, circular baking sheet, or pizza pan and tilt the pan to make sure you get full coverage of the oil onto the pan before placing your dough onto it. I normally use a pizza stone, however I wanted to experiment with using the oiled pan. In all honesty, I think the oiled pan worked really well and had a nice crispness to the crust. I think my wife would have agreed. Carefully place the dough onto the pan, keeping in mind it is really hot, and arrange the dough so that it fits the pan. Now for the toppings. Scatter the garlic on top of the pizza, then the shaved parmesan cheese. I got those nice ribbons my using my microplane to shave the cheese. 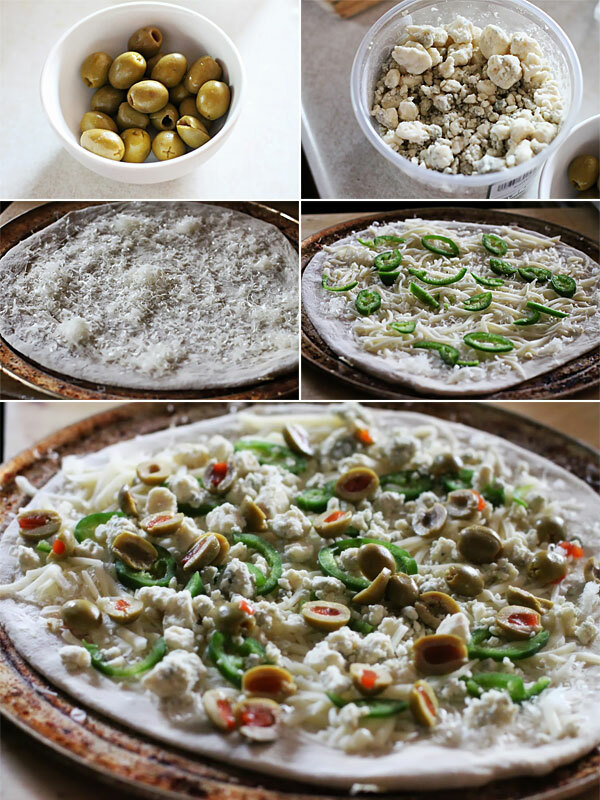 Top with the fresh jalapeno peppers, then the olives, the blue cheese, and then finish with the small amount of mozzarella cheese. Place the pan into the oven and cook for about 18-24 minutes, or until the cheese is golden. Remove from the oven, slice and serve. 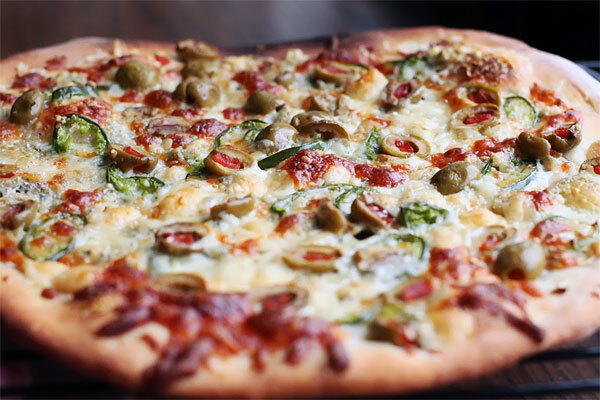 This olive and blue cheese pizza is unlike any other. You get an awesome sharpness from the paremesan and blue cheese, and this amazing brininess from the olives. When combined with the spicy garlic and jalapeno peppers, well, all I can say is have someone standing by to pull you away from the pizza. If you are looking to make something unique and different, give this pizza a try. I hope you enjoy. Lightly flour your dough ball, then begin pressing it with your fingers. Flip to repeat. Use a rolling pin if you desire to get the dough working, then begin to toss it. Here is a video as to how to toss a pizza. It's fun, and the kids love seeing it be thrown into the air.